Tuesday morning sunrise in smoky skies above Black Butte. Another helpful map I found shows structures damaged by the fire. 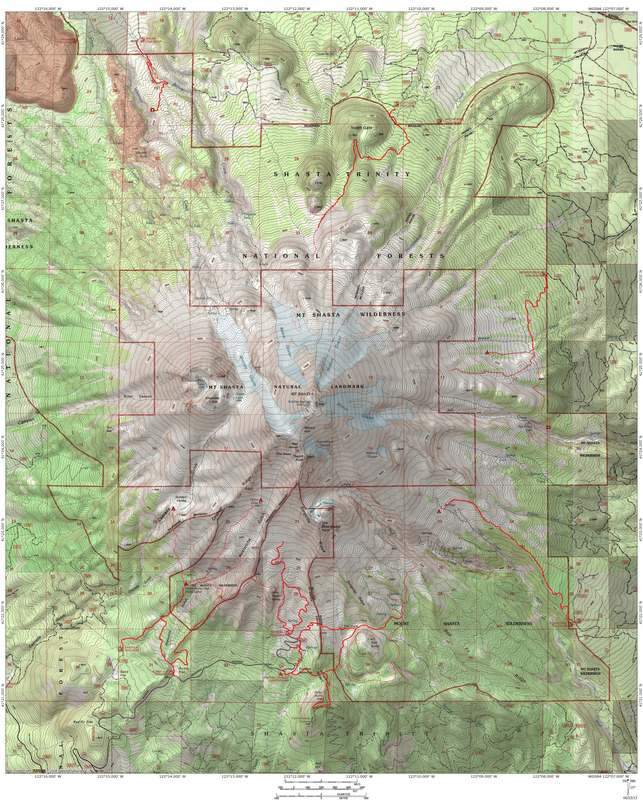 This map is in the process of being updated, so it is not yet exhaustive. It has much more detail when examined in the online version. Lastly, here is a really helpful gif that illustrates the fire’s expansion. The explosion on Thursday is very reminiscent of what happened in Sonoma County with the Tubbs Fire. Hopefully all the maps have helped. Keep praying the fire will burn itself out soon and the smoke will blow away. Lord willing! Black Butte is barely visible from my front yard on a smoky Monday morning. 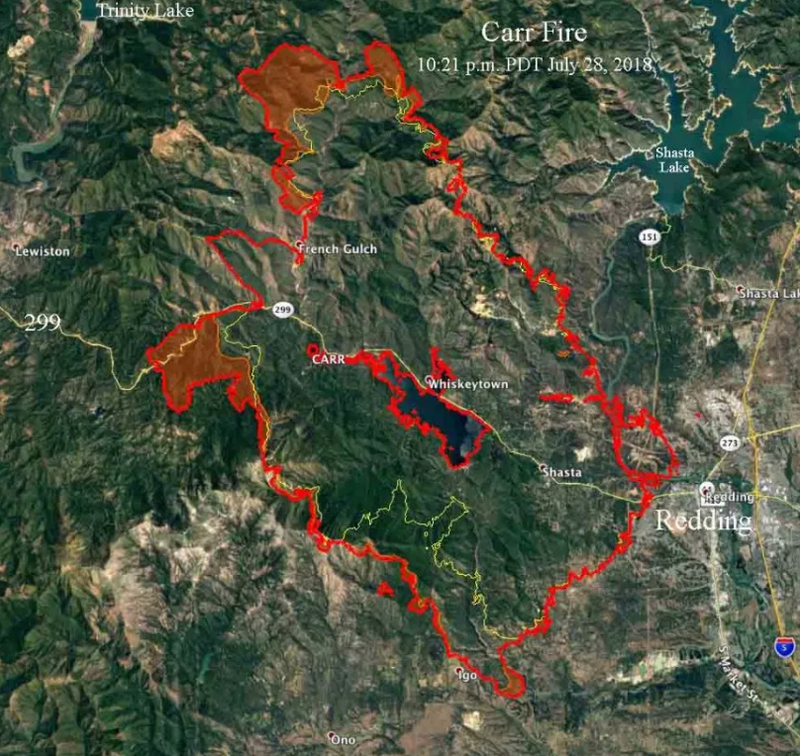 Today is day 5 since the Carr Fire really blew up and sent a firestorm down into Redding. The fire started actually started a week ago but no one foresaw the way the conflagration would erupt and slow into populated areas like it did. 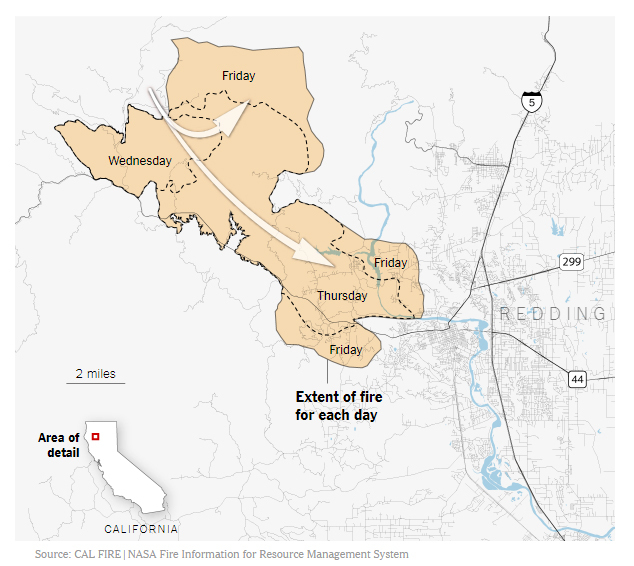 Fortunately, the lines established in Redding have held for the three days and the fire’s eastward advance has been halted. 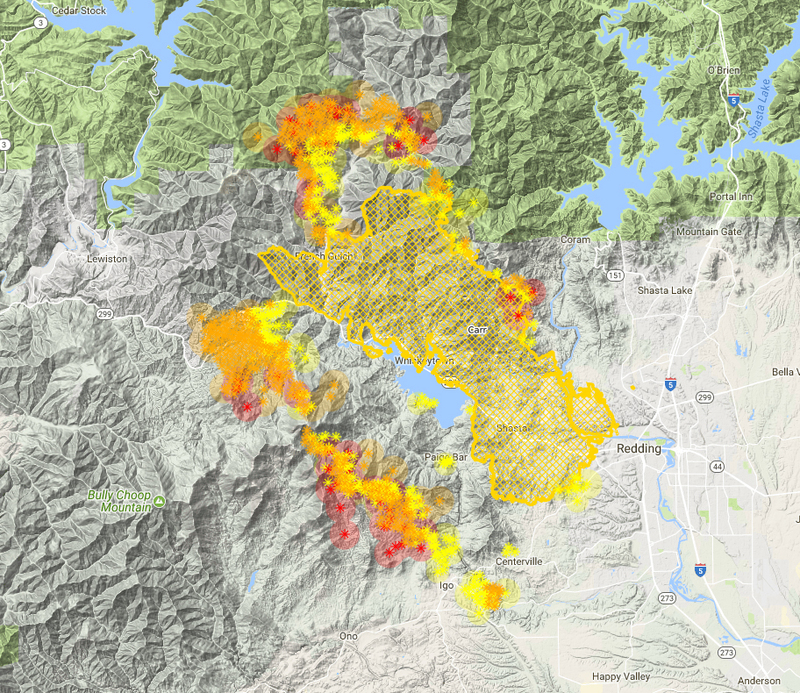 Even better, it seems to have been halted in the south around Igo and also the growth has been significantly slowed at Buckhorn Summit, though it looks like the flames will probably reach the shore of Trinity Lake. The fire is now at 17% containment and growing. I think the corner has been turned. Unless something changes and things get worse again, this is my last collection of maps that I am going to post. I am heading to Texas in a couple of days anyway, so I am going to be offline for a while. Let us pray we are nearing the end of this fire. Then the rebuilding starts. I hope some lessons can be learned from the aftermath down in Sonoma County. I have a lot of thoughts on that. 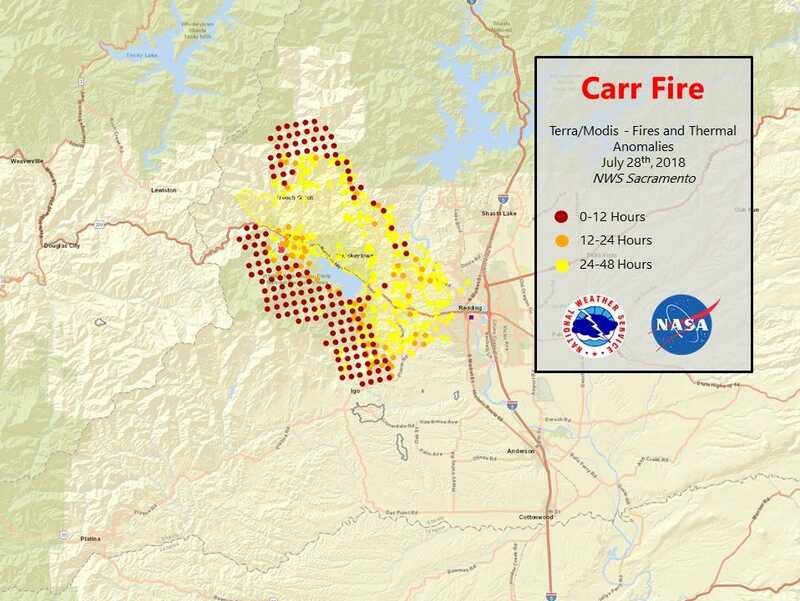 There are still some hotspots on the south and east but it looks like the danger is past for Redding and the surrounding communities. There is even mention of evacuees returning home soon. Sadly, Whiskeytown Lake looks like is in the center of a fire donut. Cue Johnny Cash. 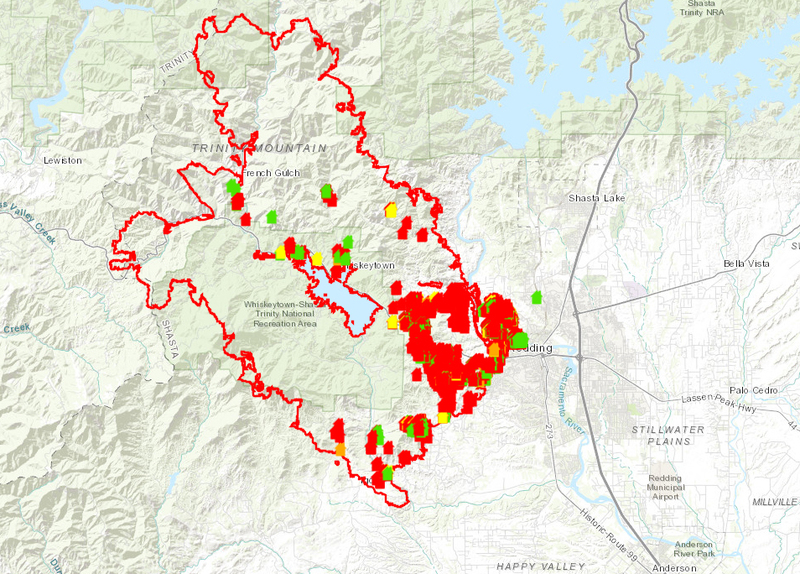 It is evident that nearly 100% of the Whiskeytown National Recreation Area burned. That is a lot of visitor center, marina, campgrounds, trails, etc. that are lost. I was even wondering if there is an archived version of the audio of JFK’s speech that he gave at the opening of the park. It was used as part of one of the displays and I am guessing it burned. Hopefully it can be replaced. It will be interesting to see how the National Park Service responds to this disaster. Looking south from the Old Ski Bowl on Mount Shasta into a wall of smoke. Yesterday things were relatively clear here in Mount Shasta, as evidenced by a beautiful evening at the Old Ski Bowl. The winds have evidently shifted because the smoke is thick up here this morning. I have been checking on the fire’s progress this morning and it seems that the advance of the fire continues to slow. I want to issue a caveat on two points though. First, I may simply be reading the data incorrectly. Second, there is a red flag warning issued for this afternoon down in Redding because it is supposed to be hot and windy. This means the even if the fire has slowed, it can still be whipped up into a firestorm again. Let’s pray that does not happen. 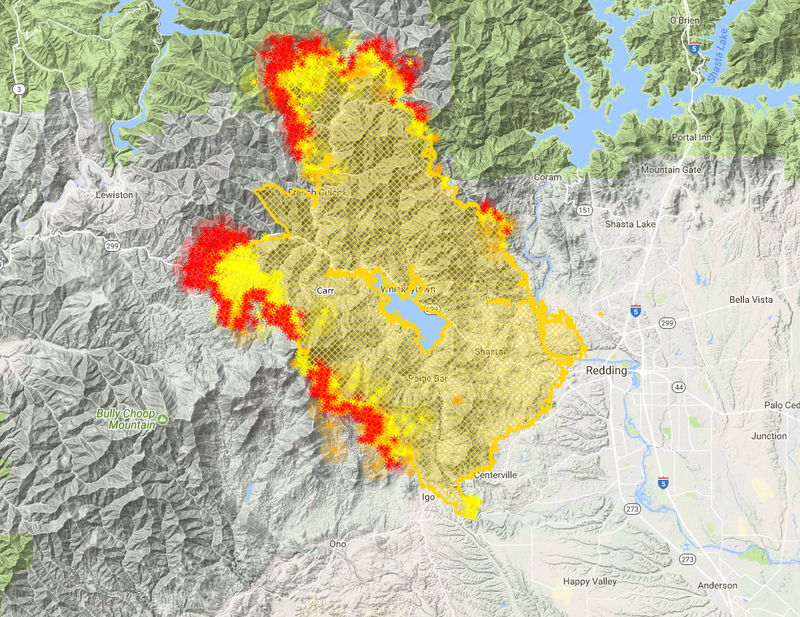 Note that now, the fire’s most intense points are to the west and north, though it does not look as intense as it did last night. Nonetheless, evacuations have been ordered for parts of Lewiston and Douglas City in Trinity County. Compared to the land around Igo, which is rather flat and not densely vegetated, the terrain heading west is very rugged, with dense woods and chaparral. Fire lines are much harder to cut and hold. 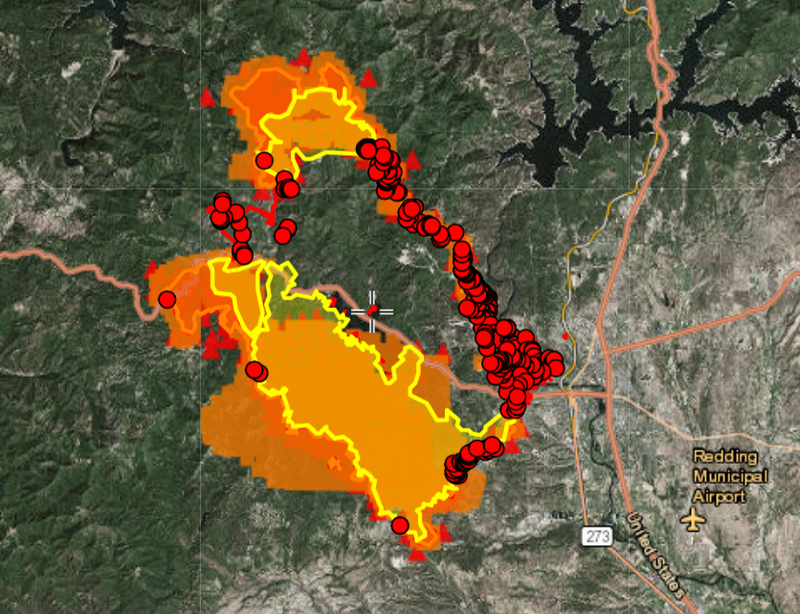 I haven’t been able to find out what the red dots mean, but the area and intensity of the fire is evident. 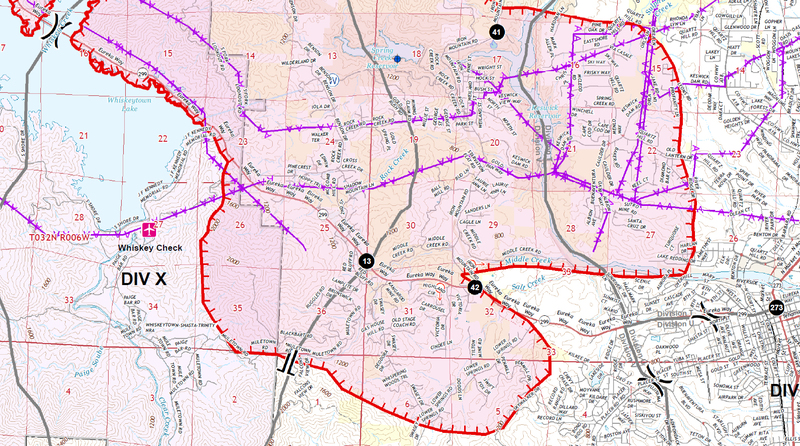 The newest areas on the map show small advance near Igo but more to the west and north. I am praying the lines at Buckhorn Summit hold. If the fire jumps that, it is a straight shot down to the heart of Trinity County. The blood moon event occurred Friday night but we still had one last night due to the smoke. Update: I definitely could be reading this map wrong and is not my intent to spread rumors or incorrect information. 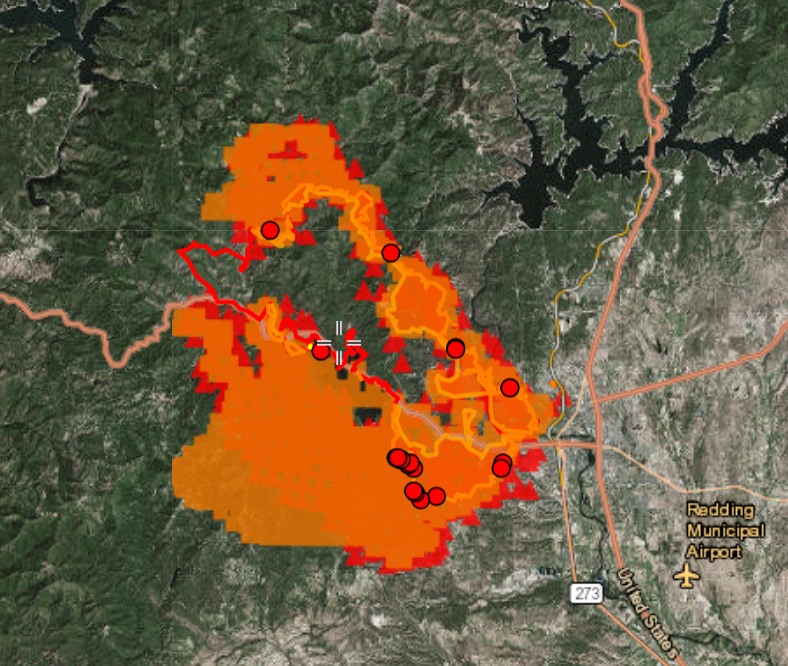 That said, this map looks like the fire is easing its intensity. It certainly does not show much fire growth. I really hope this is the case! 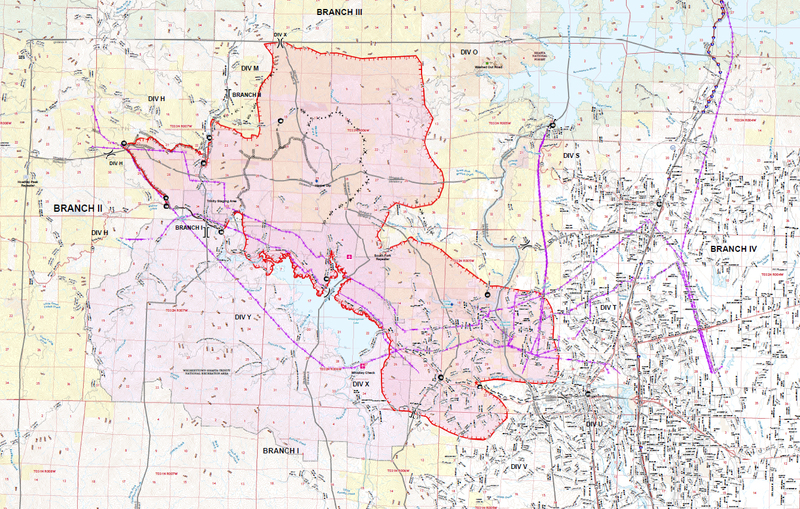 Update: This map is a few hours old but it gives a good look at the full extent of the where the fire has burned. 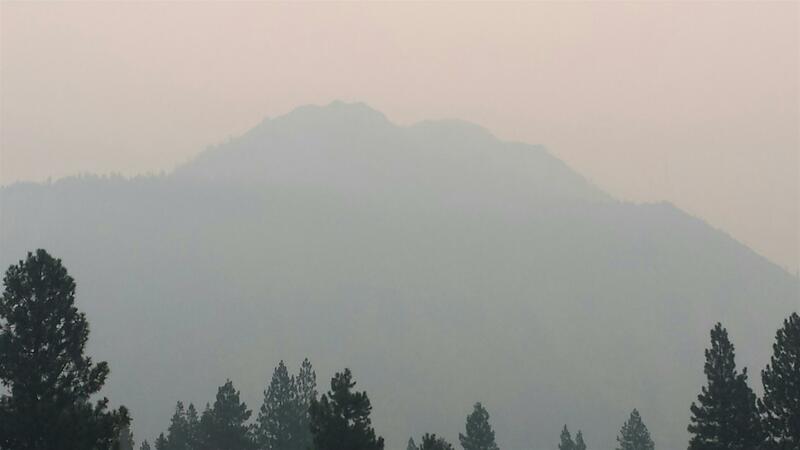 Above The Smoke (Almost) And A Fire Update. 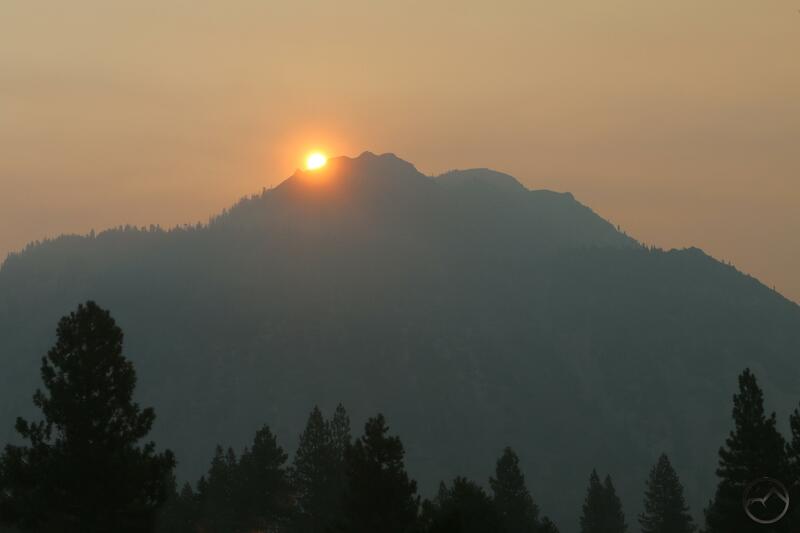 A smoky sunset on Mount Shasta. With the Carr Fire continuing to expand, I was anticipating the sky to be smoky around Mount Shasta. Surprisingly, the smoke was pretty thin and the sky blue. The hike to Cliff Lake with the Cub Scouts was a lot of fun. Since the smoke was relatively (emphasis on the relatively) sparse, I took my family up for a picnic dinner at the Old Ski Bowl. We figured thin smoke would get thinner and the temperatures were bound to be cooler. This proved to be the case and the conditions were quite nice. However, there was a wall of smoke to the south, obscuring almost everything from view. Mount Eddy and Porcupine Peak were visible but only through a very thick haze. Everything else to the south was obscured by an utterly impenetrable wall of smoke. My kids had a great time scrambling on the rocks, oblivious to the ongoing ordeal continuing to the south. I almost felt guilty enjoying the moment. The smoke was visible above Gray Butte. Clear skies were visible to the west. The smoke caused some unusual light to be cast on Mount Shasta at sunset. 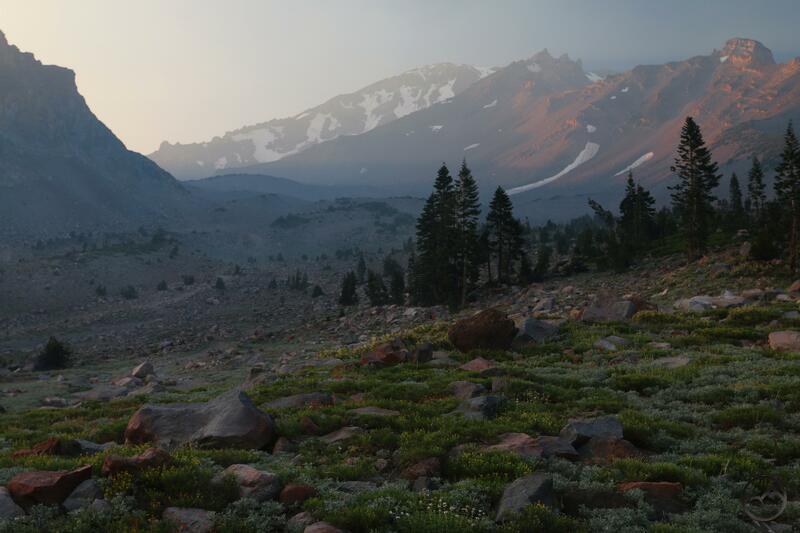 If you are looking to escape the smoke, heading up onto Mount Shasta or the Trinity Divide appears to be a good option. As far as what the fire did today, it seems to have slowed its advance to some degree. The live map shows some advance to the south, but the firefighters look to be making a strong stand at what I would call the Igo Salient. The small community is threatened on three sides but the backfires lit earlier today will hopefully keep the main part of the fire at bay. Hopefully the significant decrease in the red area is indicative of the fire activity decreasing somewhat. I would imagine that the gentler terrain, less dense vegetation and more road access will make containing the fire much easier in the south. We’ll know tomorrow morning. Keep praying. 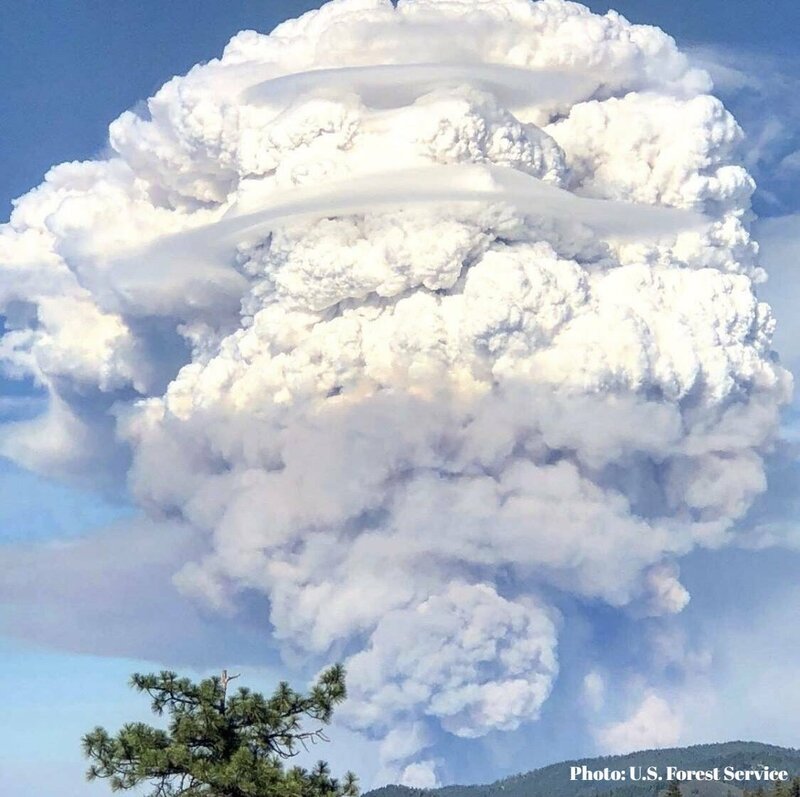 A massive, lenticular-laden pyrocumulus clouds builds above the Carr Fire. Source. 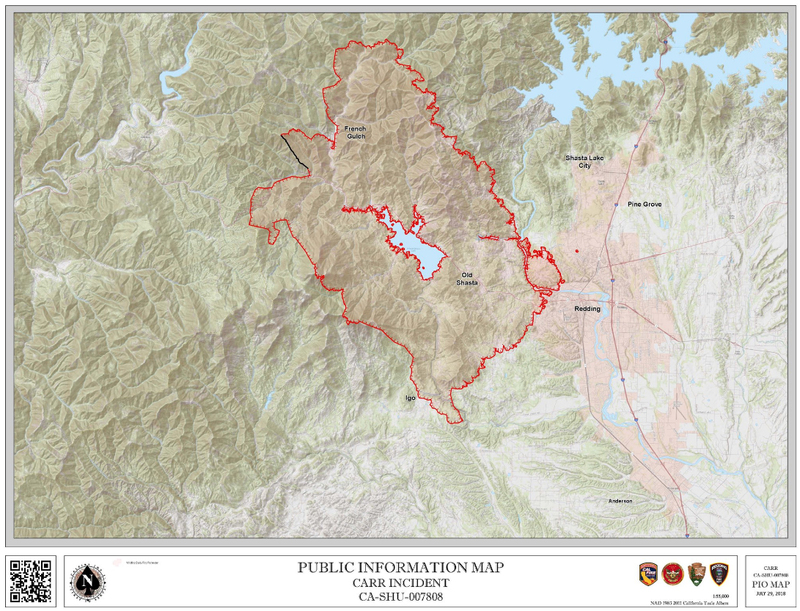 It seemed my last post rounding up maps showing the current conditions for the Carr Fire was helpful. Consequently, I am starting another one to continue monitoring the fire’s progress. So, as far as I can tell, the lines in west Redding have held and the fire has not been able to push further into the city. 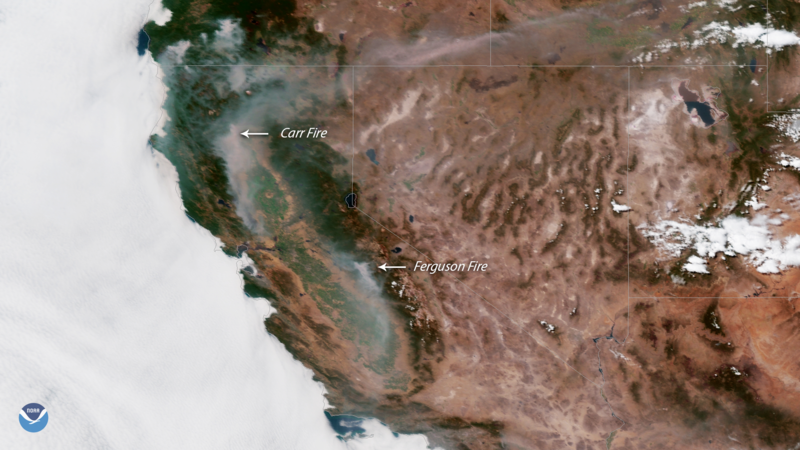 However, the fire continues to expand both to the north and, more significantly, to the south. 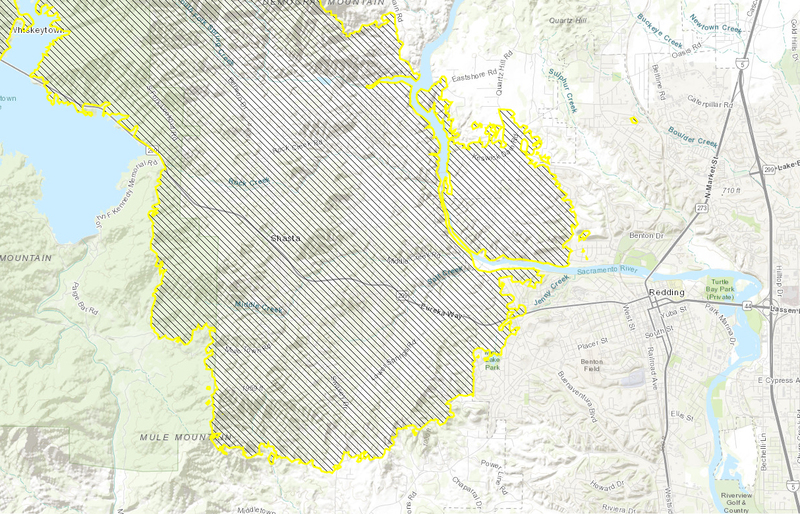 This is unfortunate, since it means a lot of beautiful terrain in Whiskeytown is going to burn. Better this than the city, but it is still sad. As the map itself notes in the key, the red dots indicate the fire is moving south. Evacuations orders for Igo and Ono have been ordered. According to the map, the threat to Igo looks imminent. Fortunately, the terrain really levels out south of Igo and there is a lot more road access to the area and less dense vegetation so cutting in some fire lines down there to contain the fire might be a lot easier. It looks like the fire is overtaking Shasta Bally, which is unfortunate. At the very least, Whiskeytown is going to have to be rebuilt from the bottom up, which is to say nothing of the hundreds of homes already lost. Strangely enough, it isn’t too smoky out right now, here in Mount Shasta. This is good, since I am leading the Cub Scouts on a hike to Cliff Lake this morning. The smoke is thin right now and I think we will be high enough to not have much around at all up there. It is thankfully cool too, so the hike should be a good one for the kids. I will check back in later today with some more map updates. Pray the fire lines in Redding hold and for all the people holding them! Not a blood moon yet, but red from the fire in Redding. 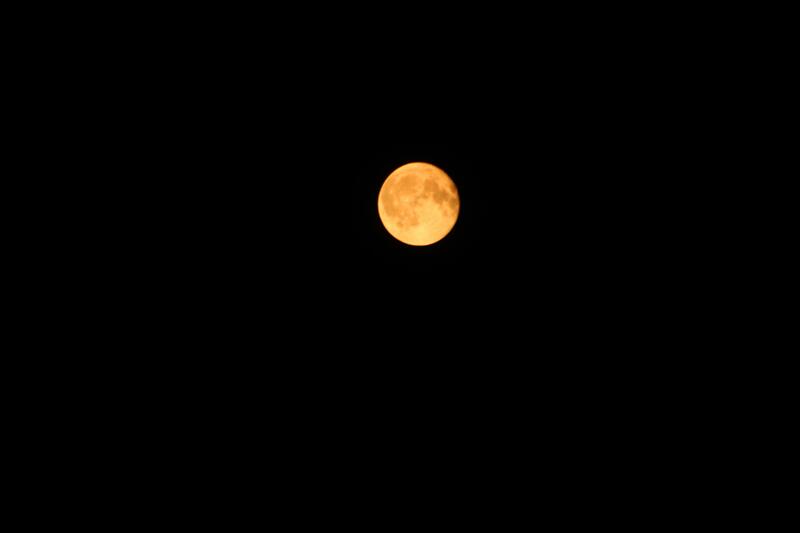 I stayed up following the fire and captured some images of the moon around 2:30, when things in Redding seemed the worst. The fire in Redding is devastating. The city remains under threat and several homes and other buildings have been consumed by the flames. Thankfully it seems that the city’s doom that seemed inevitable last night did not in fact happen. The fire is close to the downtown area and many neighborhoods but so far it seems to have held back from the densest parts of town. This is good, since in the light, the full weight of the firefighting efforts can now be brought to bear on the conflagration. 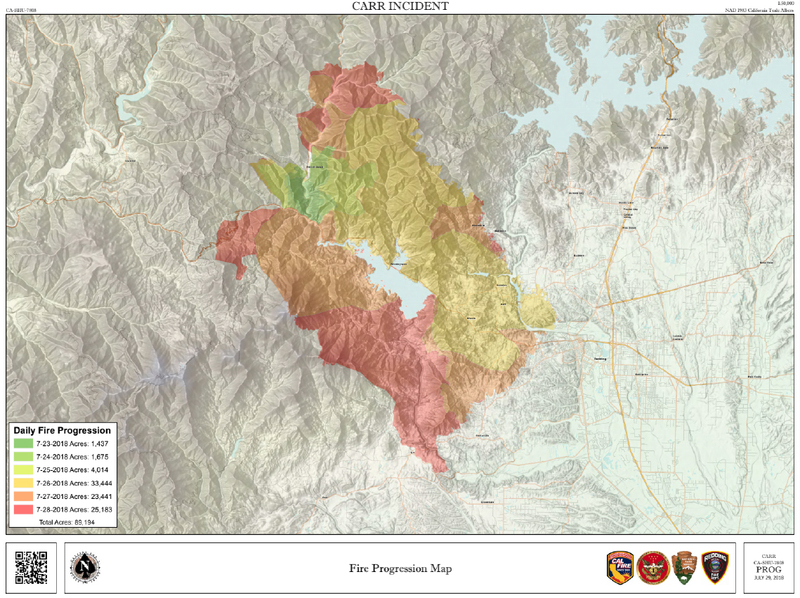 Update: Here is a really good continuously updated map of the fire. 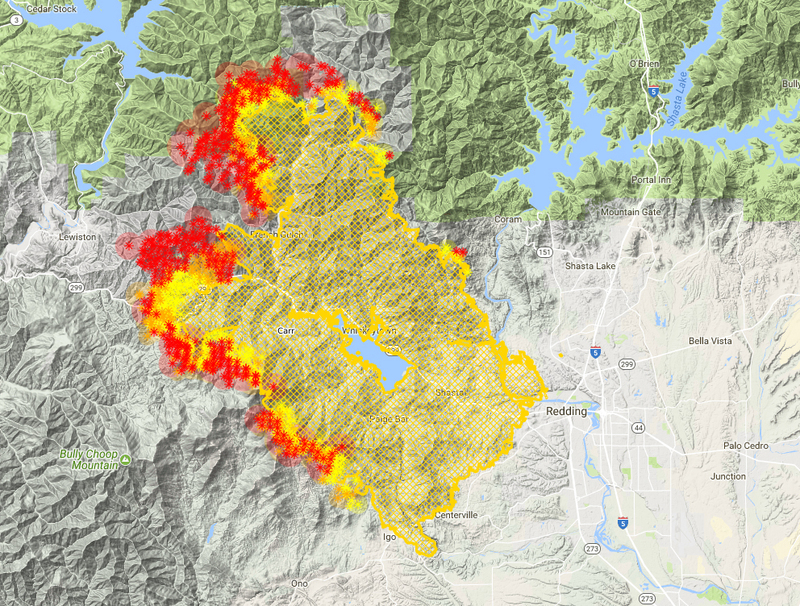 This fire shows the full 44,000 acres of the Carr fire. The Oak Bottom area at Whiskeytown is completely destroyed. 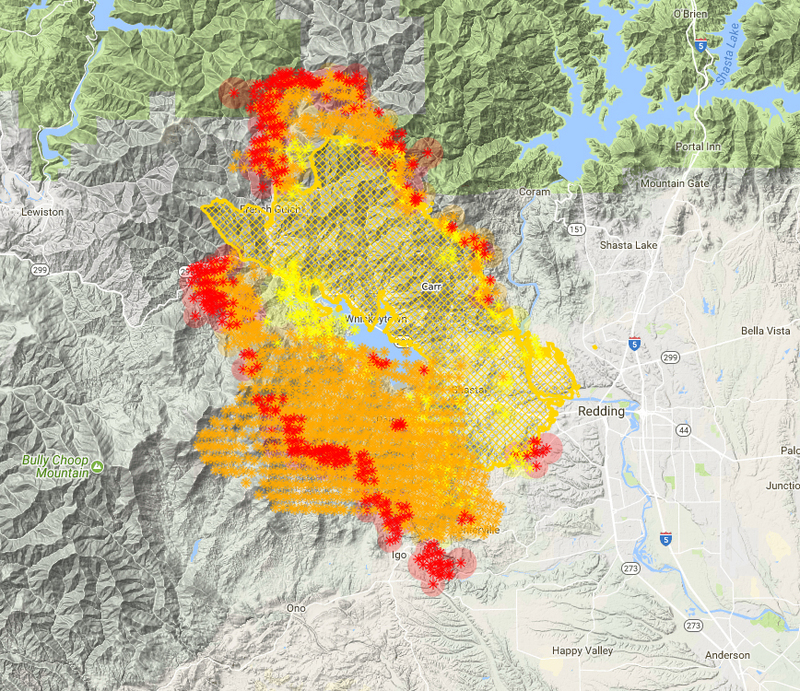 Most dangerous of all is the fire’s encroachment on Redding. 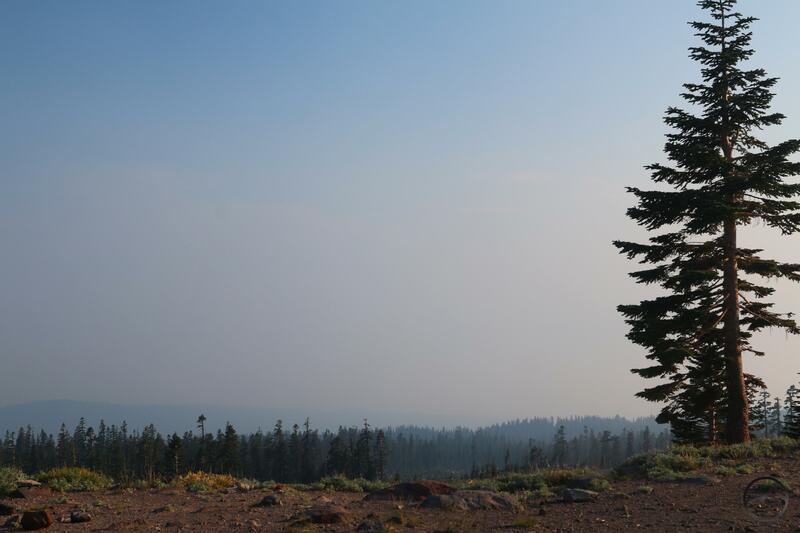 The towns of Keswick and Shasta are withing the fireline, as well as numerous semi-densely populated areas. Unfortunately the historic buildings at Shasta State Historic Park have burned. Hopefully the brick structures will still be standing. Obviously some populated areas are heavily impacted by the fire. Along with homes, the prettiest section of the Sacramento River Trail has burned. Some homes along Harlan, just west of Caldwell Park have burned. As of this morning, three homes along the rim of the Sacramento River Canyon just west of Shasta High School also burned. Fortunately, the rest of that neighborhood was saved. That seems to be the line being held by firefighters at this point. Hopefully none of this information is out of date and things have gotten worse. Last night seemed like a bad replay of what happened in Sonoma and Napa Counties last October. My parents lost their home in that fire. It is a frightening reminder that it can happen here in Mount Shasta too. I am praying that it doesn’t. I am praying for Redding too. Update: This seems to have been the current position of the fire as of 8:45 PM. It looks like they have been able to hold the line at Keswick Lake and Quartz Hill on the east side of the Sacramento River. On the west side, the line at Lake Mary looks like it is holding for now but the fire has spread further to the south. It is supposed to be windy tonight and hot tomorrow. This is a critical moment for Redding. Psalm 121.